The Epistles agree totally with what Jesus said about giving. The first incident I’ll study starts in Acts 4:32-37 and continues in Acts 5:1-11. There is a lot to be learned from these passages and I’ll only mention a few things about them. First, the believers were in agreement and sharing was common. The apostles were teaching about the resurrection of Jesus with great power and much grace was upon them. That means that many miracles were occurring. Ananias and Sapphira watched as others voluntarily sold lands or houses they owned and put the money at the apostles feet to be shared with the needy. Ananias and Sapphira decided to deceive people about the level of their generosity so they agreed to lie and say that they were giving all the proceeds from the sale of their piece of property. Peter challenged them in Acts 5:3-4 and reminded them about the freedom they had. The point I want to make is what Peter said to them “Didn’t it belong to you before it was sold? And after it was sold, wasn’t the money at your disposal?” They were free – just as we are – to give what they wanted to give. Instead, they decided to play the ‘look at me, I’m really religious game’ and didn’t recognize that they were lying to the Holy Spirit. This incident had nothing to do with tithing. It had everything to do with the deception that was in their hearts. In 1 Corinthians 16:1-4 Paul instructs the believers to “..set aside a sum of money in keeping with his income…” as they prepared to raise money for the believers in Jerusalem. It seems as though many interpret this as some kind of code word for tithing. It is not. It simply means that you the giver are free to decide how much money is in keeping with your income and you give that amount. Paul is not instructing believers to tithe. The most significant verses concerning generosity in the Epistles starts in 2 Corinthians chapter 8 and continues through to all of 2 Corinthians chapter 9. Again, there is a whole lot more contained in these verses than what I’ll cover here and I encourage you to read these and all of the verses offline. Paul first writes about “…the grace that God has given the Macedonian churches…“ as he referred to their “…rich generosity…”. In verse 7, Paul encourages the Corinthian church and believers today to ‘…see that you also excel in this grace of giving…’ These are also not code words for tithing. It means that God has provided for us some of his grace to enable us – if we choose – to be generous to those in need. The generous Macedonian church was not rich at all. In fact Paul writes in verse 2 “…their overflowing joy and their extreme poverty welled up in rich generosity…“. Once again, it is the condition of their hearts that mattered more than the amount they gave. In 2 Corinthian 9:6-7 we are reminded that if you give a little you will be blessed a little and if you give a lot you will be blessed a lot. This is referring to grace, not to the giving and receiving of money or material things. Verse 8 clearly emphasizes this fact. Verse 7 clearly states “Each man should give what he has decided in his heart to give…“ Believers need to search their own hearts and give what they are really happy to give. No more, no less. The amount you should give is the amount you should give. God does not expect the same level of giving from two people that earn the same amount of money! Let me emphasize that some more. Even if two people earn the same amount of money, live in the same neighborhood, have the same number of kids, have cars that cost the same, have rent that cost the same or homes that cost the same, work at the same company, have parents and grandparents the same age, work the same amount of overtime, walk the same, talk the same, and look the same God still doesn’t expect the same level of giving from each person! 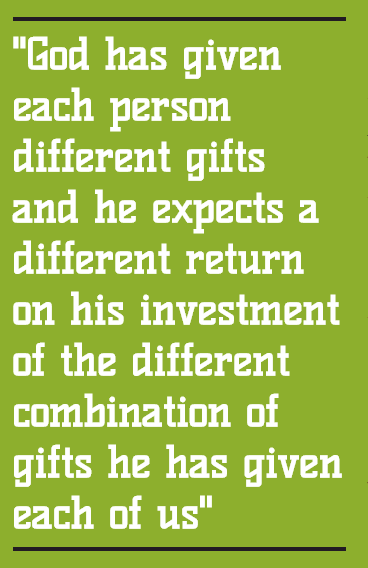 God has given each person different gifts and he expects a different return on his investment of the different combination of gifts he has given each of us. Romans 12:3-8 explains that we should look at ourselves soberly ‘…in accordance with the measure of faith God has given you…’. It goes on to explain that ‘…..We each have different measures of faith and different gifts and God expects different results from each of us. That includes different amounts of giving even from people that earn the same amount of money! God is not looking for people to tithe. God wants his people to obey him as he speaks to your heart. Search your own heart and determine the amount you can freely give and cheerfully give it.